Can it be daily driven, incl. winter? I'm a guy who buys higher mileage, mid-entry premium lux autos. 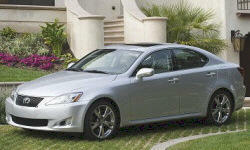 Looking at some Lexus IS-F's, in the 100,000km++ range, 2008-2010 vintage. Is this car a good driver in all climates (located in Canada, GTA)? Can you live with it day-to-day, as a commuting vehicle? Sorry that no owners have responded to this. I drove an IS-F for a week for review purposes, and earlier owned a GS 400 for a while (father's ex-car). The IS-F seemed very livable in day-to-day driving aside from being very thirsty. I did not have it when there was snow on the roads, though. I suspect that with proper winter tires it would be drivable in snow, but you'd have to exercise more caution than in something like a Camry. I did test an IS 350 AWD with snow on the roads. Absolutely no trouble driving it. Thanks for the reply Michael. Yes I am starting to lean toward a used IS350 (or maybe 250), based on availability and pricing. Outside chance of a 4G Acura TL. Currently in 3G Acura TL, love it, but KM's are rapidly climbing. The 250 feels weak. You'll want the 350 between those. The TL SH-AWD can be fun, especially if you get one with a manual transmission.